And here we are at the last week in November. Where has this year gone? November 25 - National Parfait Day! November 26 - Cyber Monday! November 27 - National Bavarian Cream Pie Day! You had me at PIE! November 28 - National French Toast Day! November 29 - Electronic Greetings Day! You know what that means, right? Here goes . . . Hey y'all! November 30 - National Mason Jar Day! I've seen tons of craft ideas lately using Mason jars but I'm old enough too remember how these jars were intended to be used. 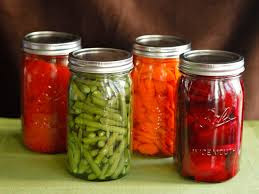 Preserving enough food in the summer season to feed a family through the winter. I canned my share of veggies over the years and still have my first pressure canner. December 1 - National Eat A Red Apple Day! What's your favorite color or type of apple?